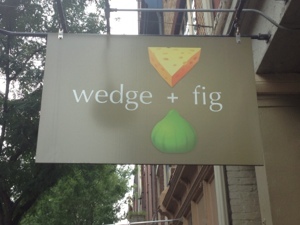 I have always viewed cheese as a delicacy, a slightly enchanting food, whimsical, and yet romantic, and you will be able to partake in all of of these qualities at “Wedge + Fig” in Old City Philadelphia, Pennsylvania. All of you cheese lovers know cheeses have different levels that can go from salty, to pungent, to smooth, to rich in flavor; depending on what you are in the mood for you can capture this desire and when you pair them with wine or honey or sweetened cranberries, you have officially entered into a wonderful afternoon that the last dog days of summer were made of. 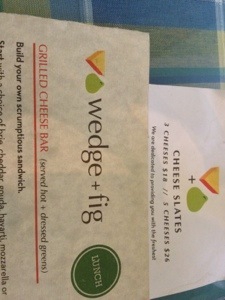 Not only can you select from a mirage of cheeses at “Wedge + Fig, ” but I opted for my favorite cheese…goat cheese. This was not the crumbled goat cheese you get from Trader Joe’s this was a drunken wine rind goat cheese cut in wedges, where I paired it up with prosciutto, and as a compliment of the restaurant served with almonds, cranberries drizzled in honey with a side of sliced baguette; the cheese was light with a hint of saltiness, with a backdrop of a pale white wine flavor. 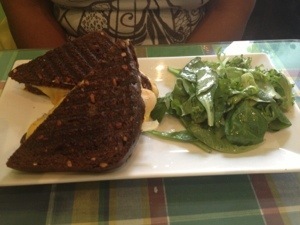 “Wedge +Fig” even attempted to entertain the child in all of us, by having a grilled cheese bar, where we ordered grilled cheese on house made pumpernickel, sautéed onions, and black olives. 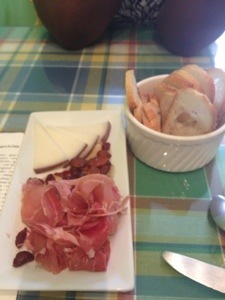 The combination seemed strange when integrating the black olives with the sweetness of the pumpernickel, but together the taste was absolutely gratifying. 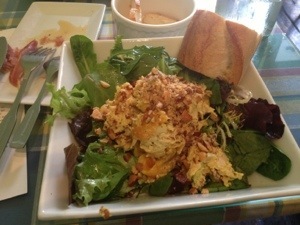 Whenever there is a bread, it is always fitting to order salad, just to make the calorie intake somehow balanced…so curry chicken salad on a bed of field greens it was. The chicken was shredded, with smoked almonds, dried apricots, celery, onion, and sweet maharaja curry, was made to perfection. 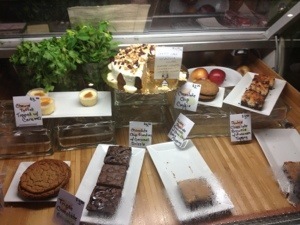 I love when lunch hits the spot, it is especially great when everything is working on all cylinders, beautiful day, quaint atmosphere, and food that makes you feel giddy like a drinking lemonade on a summer day…well done “Wedge + Fig” well done!!! !